was inaugurated on 3. 12. 1909, this year it celebrates 108 years of its existence and is one of the oldest cinema halls still in operation across Europe and the world. 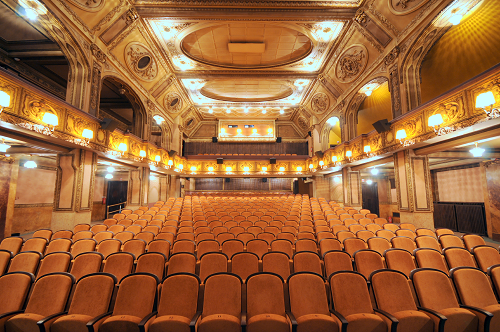 During this incredibly long time, tens of thousands of movie titles were shown on the cinema screen of this prestigious cinema, which is an integral part and decoration of the Lucerna Palace, millions of viewers sat in the seats and hundreds of movie stars stood on the stage at grand premieres of their films. Currently the cinema hall has 453 seats, it is equipped with cutting-edge 4K digital technology also enabling 3D projection, with Dolby Surround 7.1 sound system and it is the most visited classic cinema in the Czech Republic. welcomed its first audience at the end of 2013. 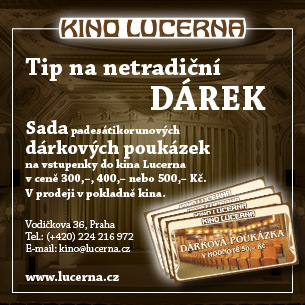 The premises in which it was created have a very interesting history - more than seventy years ago, there used to be a private screening room of the co-owner of the Lucerna Palace and the founder of the Barrandov studios Miloš Havel (the uncle of President Václav Havel and his brother, a scientist, Ivan M. Havel). The hall had served primarily for private previews of films produced under brand of the production company Lucernafilm, or for private screenings accessible only to the closest friends of the owner. As far as we know, there had never been screenings organized for the general public. After the nationalization the hall was closed and the premises were structurally divided into several smaller rooms. We are honored that in these historic premises we can currently operate a small cinema with a capacity of 51 seats, with unconventional decoration with portraits of leading Czechoslovak, European and international filmmakers and actors, including the portrait of Miloš Havel at the seat of honor in the middle of the first row. The hall is equipped with 2K digital projector with 3D projection and Dolby Surround 7.1 sound system.